"Dr. Habeeb Hasseem, B.E., M.E., PhD, a very senior retired Aircraft Designer and Aeronautical Engineer, kindly took time out of his holiday to India, to visit Al Qamar. Dr. Hasseem and his wife toured Montessori and saw how the students learn. Later, he spoke to the older children about his experience in the aircraft industry and NASA projects in designing planes and rockets. He spoke about how planes are designed, how they fly, the use of the tail wings, the storage spaces for fuel etc. The children were enthralled and asked a volley of questions. "What happens when both engines catch fire?" "Why does a plane need to land on water?" "How do you test for bird hits?" "How long does it take to design a plane?" 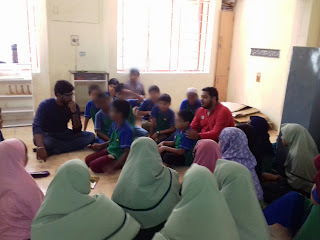 He patiently answered all their questions in a simple and clear manner which made a complicated topic like Aeronautics comprehensible for children. It was with great difficulty that the children let him go at the end of the session.